Do you know the saying “You either die a hero or live long enough to see yourself become a villain”? I feel that way about tv shows. They either get cancelled too early, or they just go on for too long and end up messing up in one way or another. Especially when it comes to their characters. No matter how much I can love a show, nothing annoys me quite as much as a badly or unfairly handled character. So today, I decided to focus on a few of the characters that I feel deserved better. Note: this list contains spoilers so proceed with caution. As much as I LOVE The 100, the show does have a habit of treating their characters badly. Think about Lexa, who had so much potential only to fall under the bury your gays trope. Or Lincoln, which was just unfair on so many levels. But a character I personally was hurt by was Jasper. As a part of the original cast, he was one of my favorites in the first two seasons. And then it’s like they didn’t know what to do with him anymore, massacred his personality and gave him a mental health problem that they handled extremely poorly only to write him out of the show in the most lazy way possible. He deserved better. Oz was one of my favorite characters on the show and his relationship with Willow was the best. But then they had to make him do something completely out of character, only as a way to write him out of the show. Not cool show, not cool. Granted, she was never the most loved character. But most of that was due to writing and I should have known that when I actually started to genuinely like her character, that it wasn’t meant to be. And naturally, she was then killed off in the most stupid way possible for drama purposes and her last words were just to prop Oliver and Felicity. Nope. As much as I loved Charlie, I should have known better than to trust this show which has honestly handled most of its female characters terribly. I had hope for Charlie when nothing terrible happened to her for a few seasons and I thought she could be just a fun recurring addition to the team, but alas she was written out in the most dramatic way possible. I actually really liked Julian’s addition to Team Flash and was happy that he didn’t turn out to be just the expected evil British guy. I loved his relationship with Caitlin and I had such high hopes for his future on the show and then they just decide not to bring his character back in the new season, with hardly any mention of him anymore? I do not agree. Jen was such an interesting character and her journey throughout the series was a joy to behold. But that final episode? Her ending felt just as a way to add more drama for the others and felt completely unneccessary. Nope, I was not there for that. Cordelia was one of the funniest characters from Buffy and bringing her to the Angel spin-off, a much darker show, felt like a genius move. And it was, for the first few seasons. And then they neutered her personality and gave her the most stupid storylines only to kill her off in the most unneccessary move ever. As much as I loved Teen Wolf, the show also had a reputation for not being so nice to their characters. I’m thinking about Alison or Isaac or really almost any of the secondary characters. But the character that bugged me was Kira. Her character was also written off in between seasons and her story just never felt finished. Plus she was supposedly Scott’s girlfriend, how come she was even barely mentioned in the last season? Just… ugh. Bonnie feels like a must in any ‘characters who deserved better’ list. She was constantly sacrificing everything, including her life, for her friends and what did she get? She got crapped on by the writers. I stopped watching and didn’t even see the last few seasons, but I heard she didn’t even get her happy ending in the end, just more crap, which is so completely unfair. It was so predictable and yet I am still crying. He deserved better. That is all. WHich tv characters do you feel deserved better? I feel like as soon as Bob was introduced, we all thought two things: 1) He’s actually a bad guy and will betray them, 2) He’s as perfect and sweet as he seems, and therefore will die. Both options suuuucked. I still cried. 100% agree with this list. Especially my baby Oz. Oz’s ending still hurts me to this day. Love this fun spin on the topic, Lindsey. I should have done something like this too, because I’ll admit, I struggled with this week’s meme. I liked Laurel fine, but in terms of shipping Oliver with someone, it’s always been Felicity. Seeing “Arrow” and “The Flash” on your list is reminding me again how FAR back I am on playing catch up with these two shows. I need to remedy this asap. 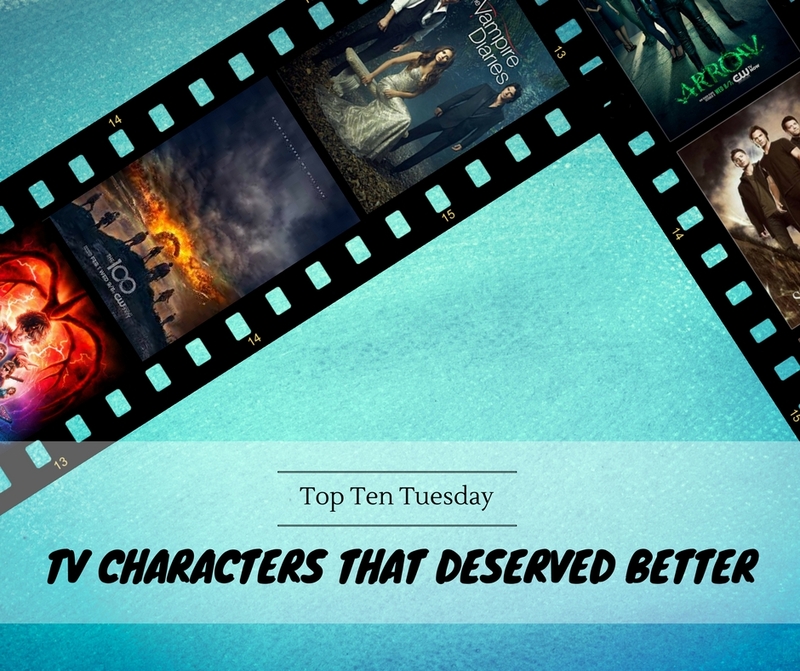 Rissi recently posted…Top Ten Tuesday | Characters I Like. In Stories I Don’t Love. I love your take on the list this week. Totally with you on Oz and Cordelia! Thanks! Oz and Cordelia both deserved so much better! Yes, I get that the actor wanted to do other things, but they could have at least written him off in a way consistent with his character. What they did instead just sucked in so many ways. I agree with lots of these like Bonnie…she was done wrong so many times and never got to have her “happy” time. Jasper is the same I wondered what happened between seasons as his character did a 180 (I marathoned 1-current). And I cried when they cut out Charlie and I also miss Draco on Flash like bring him back please! Bonnie totally deserved her happy ending! It annoys me that they couldn’t even have given her that. Jasper’s character development hurt me so badly, I felt it was just lazy writing, like they just didn’t know what to do with his character anymore. Charlie :'( And yes #BringBackDraco! I couldn’t agree with you more about Oz and Cordelia. They were both written off of their shows in very silly ways. Definitely, they both deserved so much more! I love Oz but what they did to Cordelia was just unacceptable. Her ending was one of, if not the worst on those two shows. Yes, she was such an amazing character and deserved so much more than what she got. Oh, Bob! That one hurt. I also just realized that Julian wasn’t on The Flash anymore – shows how much I pay attention! Although, I did think he was a great character. Bob was such a nice and genuine guy, it broke my heart when he died. Charlie, oh god, she was super awesome geeky and one of the best female characters in the show and the way they killed her off, so not done! I still wish somehow they would bring her back. And Bonnie, she just sacrificed and sacrificed and sacrificed. Her character definitely deserved a happy ending after all she had been through but nope! I’m glad I stopped watching after season 6. The Flash is kind of boring me now…? Julian was such a great addition to the team and but he poofed off. So, I also poofed off! I really enjoyed your list and Bob, now I’m sad. It was such a rough moment last season. Bob yes! Just thinking about it makes me want to cry all over again. From this list, I have seen only The Vampire Diaries and Stranger Things. Totally agree with you on Bonnie. She was one of my favourite characters in the show and she totally deserved all the happiness. Yeah, the ending for her was bad as well. And Bob! I am crying now. I wanted to see him more. Yes, exactly! After all Bonnie went through, at least she should have gotten her happy ending. I loved Bob and would have loved seeing more of him too! I agree on Oz, but if I recall correctly, Seth Green was looking to do more movies and was trying to get written off. Still here for Justice for Oz! I have ranted about The Vampires Diaries so much. I stopped watching after season 4 when everything was going to hell… I just couldn’t stand everyone’s personalities changing to make the new relationships make sense… I heard about how it ended and it sounded terrible. Honestly, I have given up on all CW shows because they alway start out great and then they slowly but surely end up sucking. Yes, totally agree! If anything, I just wish I stopped watching even sooner. Julian totally deserved better! I mean I understand they probably couldn’t bring him back due to Tom Felton’s schedule, but they could have given him a better ending! Yes, exactly! They could have at least given his character some closure in the story, not just make him disappear in between seasons. Ugh… now I’m sad all over what they did to Jasper, Oz and Cordelia. They all deserved so much better! They definitely did deserve better! This post gave me a lot of nostalgic emotions! Way to end with Bob and just give me all the feels. But I totally agree on so many of these, especially Charlie from Supernatural and Julian from The Flash! Yes, they definitely deserved better! I heard about the issues behind the scenes of Teen Wolf as well. It’s a pity it had to end that way, they should have at least given the character of Kira a better ending. Omg this makes me want to rewatch Buffy so bad! Cordelia was probably my favorite character so yeah, I totally agree with this! Also, poor Bob! He did deserve so much better! The only show I really watched on your list was Dawson’s Creek, but I have to agree with you about Jen, she really deserved better and I felt like, it was just because Jen led an hectic life before and everything else that she had to, somehow, end up this way. It seemed unfair and kind of stupid, I mean, she deserved a happy ending with her daughter and everything and THAT MADE ME SO MAD. Also, I am mad because I cried a whole lot when I saw that last episode haha. Huh… I haven’t watched the last couple of seasons of The 100..
And I loved Oz too! I was sad when he left. I feel like I didn’t get to finish Angel either because I don’t remember what happened to Cordelia! I actually enjoyed her on that show so much. Ah I’m sorry, I hope I didn’t spoil you for any of these series!